Pain relief for headaches, menstrual pain and cold symptoms. This medicine is used for short term relief of headaches, including migraine and tension headaches, toothache, backache, rheumatic and muscle pains, neuralgia and period pain. It also relieves feverishness, aches and pains of colds and flu. The active ingredient is paracetamol which is a painkiller and reduces your temperature when you have a fever. 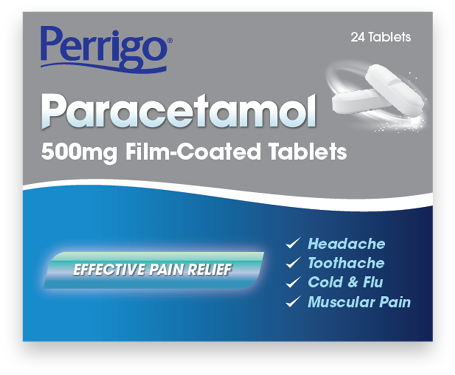 Paracetamol 500mg Film-coated Tablets. For the short term management of pain. Always read the leaflet. This medicine is used for the short-term relief of mild to moderate pain such as headache, period pain, dental pain, and fever and pain associated with the common cold. If this medicinal product is required for more than 3 days in the case of fever or for more than 4 days for the treatment of pain, or if the symptoms do not improve or worsen a doctor should be consulted. 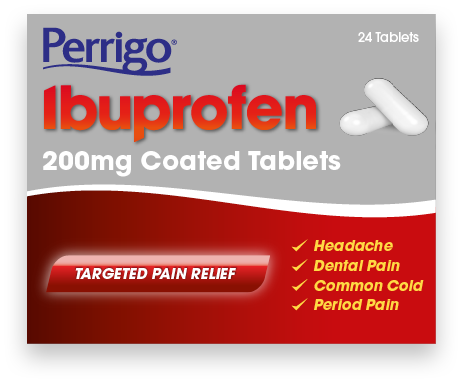 Ibuprofen 200mg Coated Tablets. For short term symptomatic relief of mild to moderate pain. Always read the leaflet.